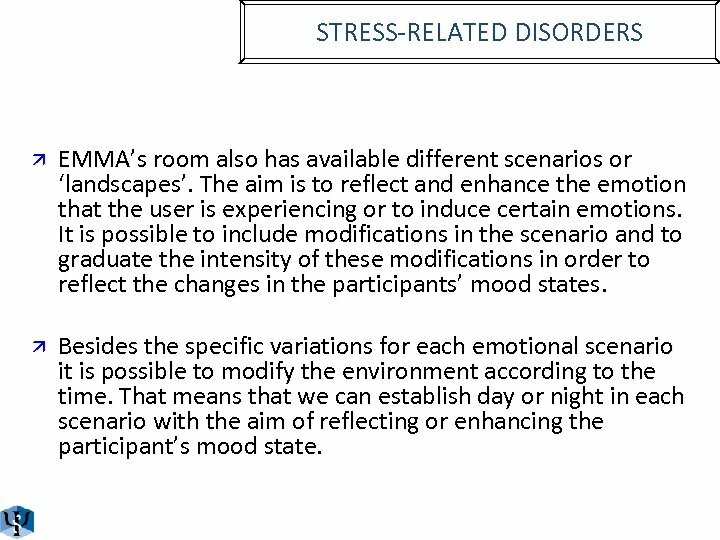 STRESS-RELATED DISORDERS ä EMMA’s room also has available different scenarios or ‘landscapes’. 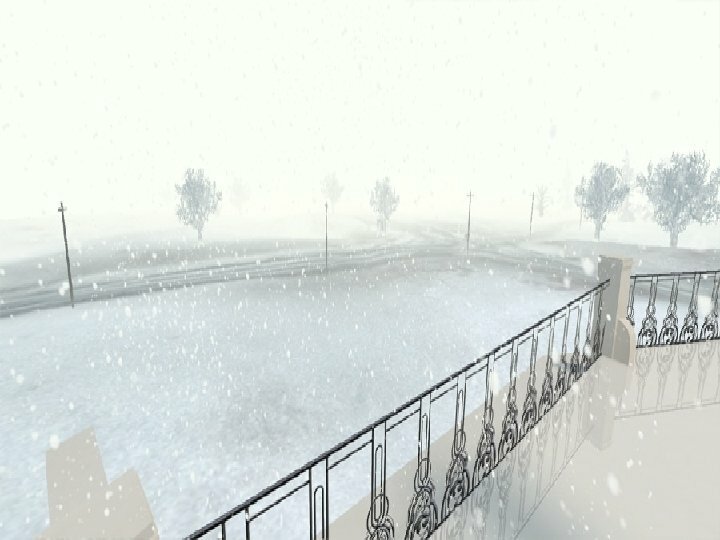 The aim is to reflect and enhance the emotion that the user is experiencing or to induce certain emotions. 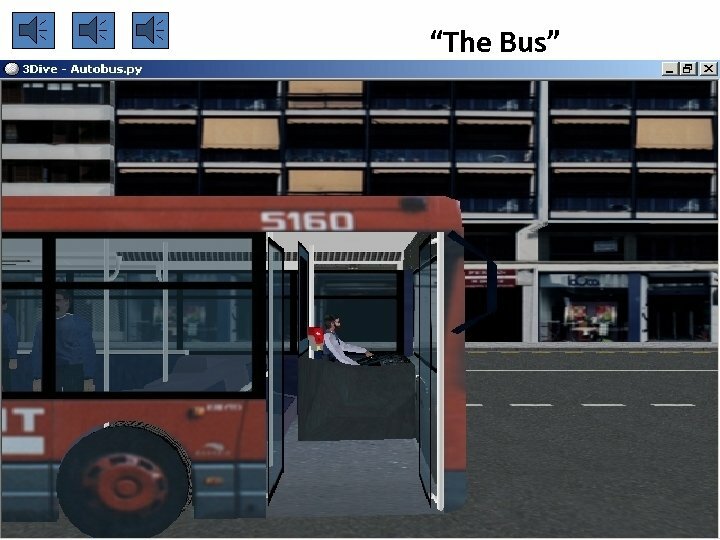 It is possible to include modifications in the scenario and to graduate the intensity of these modifications in order to reflect the changes in the participants’ mood states. 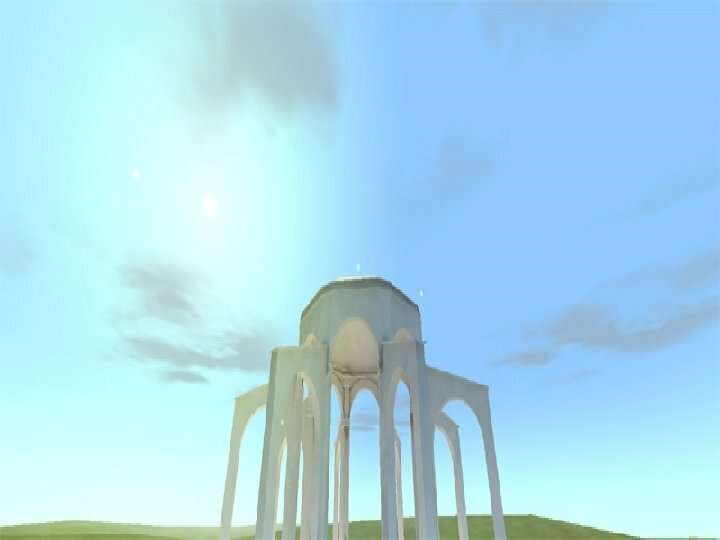 ä Besides the specific variations for each emotional scenario it is possible to modify the environment according to the time. That means that we can establish day or night in each scenario with the aim of reflecting or enhancing the participant’s mood state. 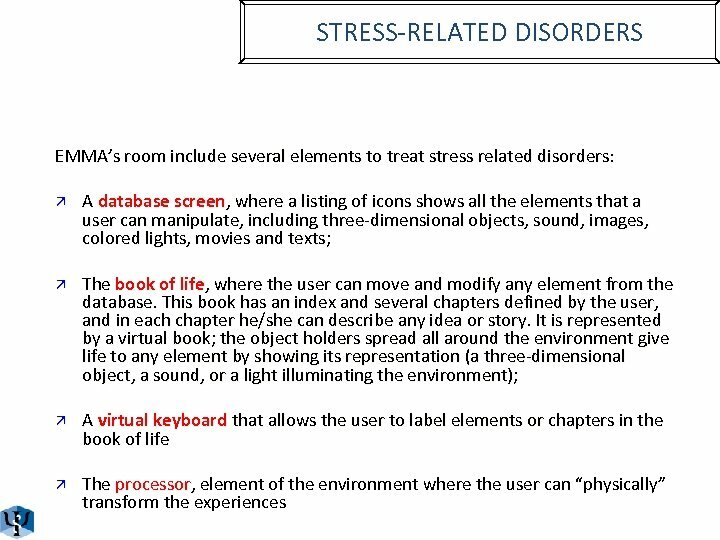 STRESS-RELATED DISORDERS ä In summary, the different three-dimensional objects, the sounds, the colors, the lights, the images, the symbols. . . all of them are designed to help the person to confront, accept and manage the emotions and experiences that he/she has gone through previously in his/her life and is going to experience in therapy environment. 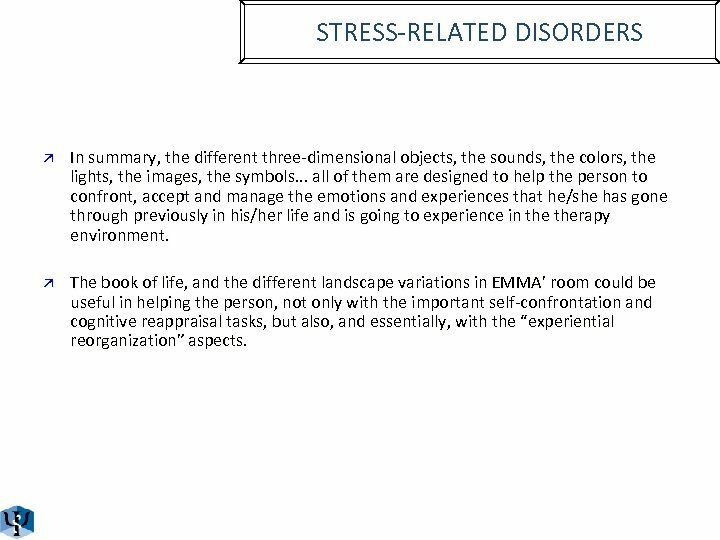 ä The book of life, and the different landscape variations in EMMA’ room could be useful in helping the person, not only with the important self-confrontation and cognitive reappraisal tasks, but also, and essentially, with the “experiential reorganization” aspects. EMMA’S ROOM Other Applications • EMMA’S ROOM: Flexibility – We have used EMMA for the treatment of fear of storms in a case study. – A 70 -year-old woman with a severe storm phobia. 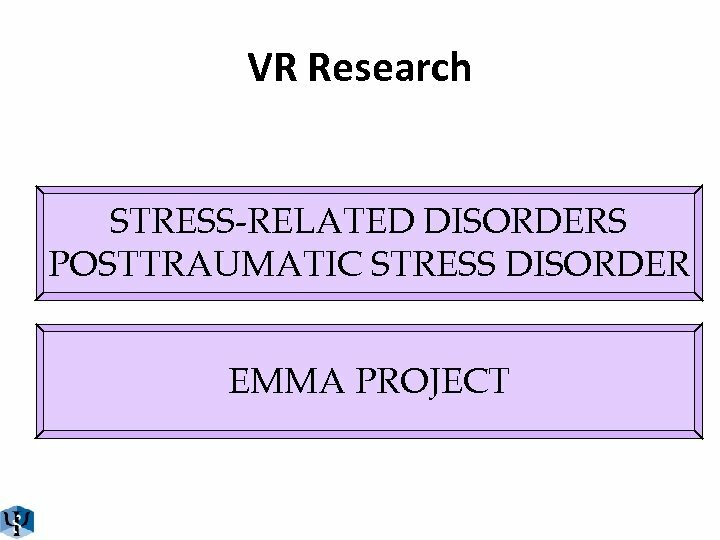 – Two intensive exposure sessions with EMMA (3 hours each) – Good results: Clinically significant reduction in fear and avoidance, and in impairment and distress. 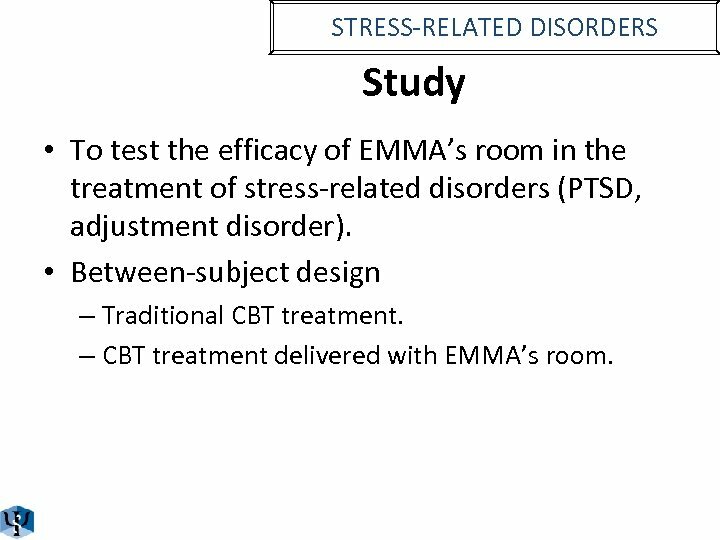 STRESS-RELATED DISORDERS Study • To test the efficacy of EMMA’s room in the treatment of stress-related disorders (PTSD, adjustment disorder). • Between-subject design – Traditional CBT treatment. – CBT treatment delivered with EMMA’s room. 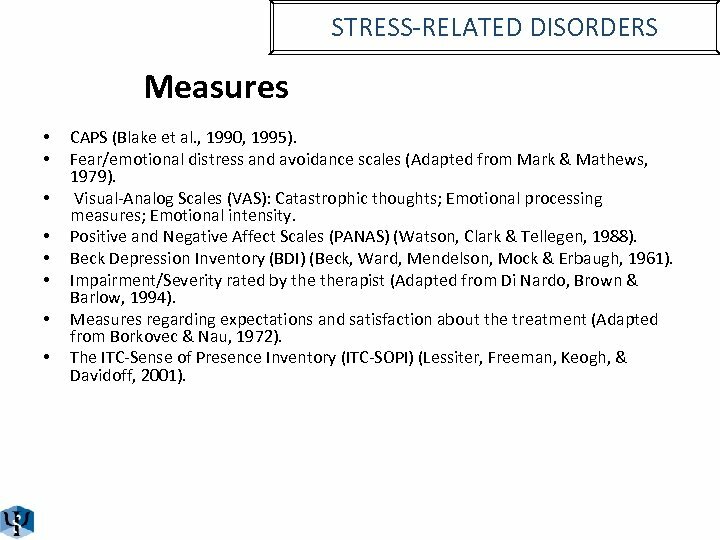 STRESS-RELATED DISORDERS Measures • • CAPS (Blake et al. , 1990, 1995). Fear/emotional distress and avoidance scales (Adapted from Mark & Mathews, 1979). 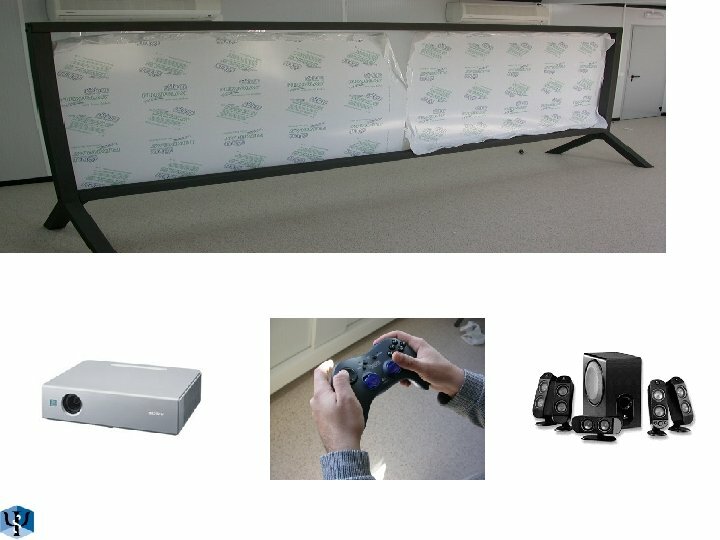 Visual-Analog Scales (VAS): Catastrophic thoughts; Emotional processing measures; Emotional intensity. Positive and Negative Affect Scales (PANAS) (Watson, Clark & Tellegen, 1988). Beck Depression Inventory (BDI) (Beck, Ward, Mendelson, Mock & Erbaugh, 1961). 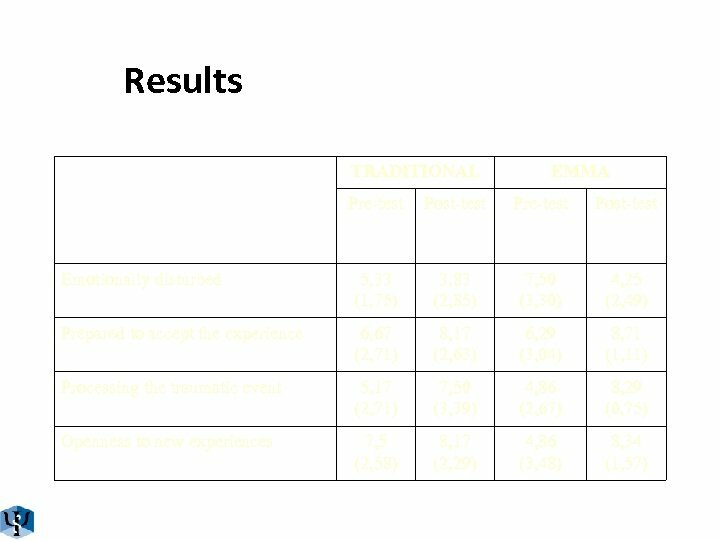 Impairment/Severity rated by therapist (Adapted from Di Nardo, Brown & Barlow, 1994). Measures regarding expectations and satisfaction about the treatment (Adapted from Borkovec & Nau, 1972). 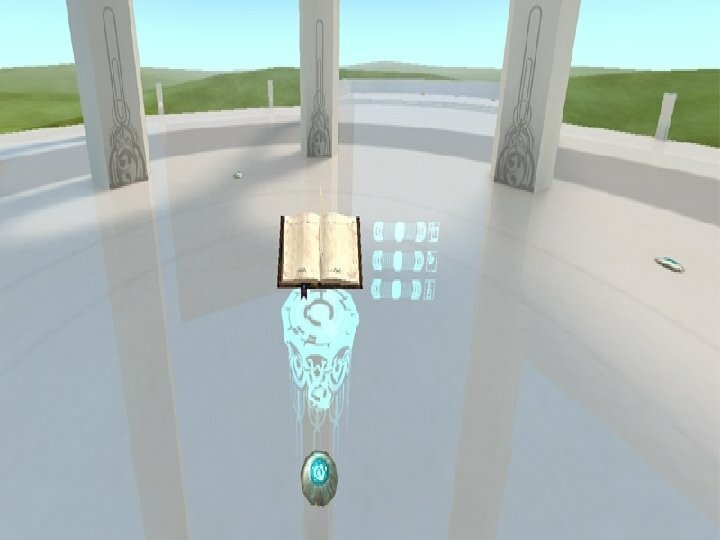 The ITC-Sense of Presence Inventory (ITC-SOPI) (Lessiter, Freeman, Keogh, & Davidoff, 2001). 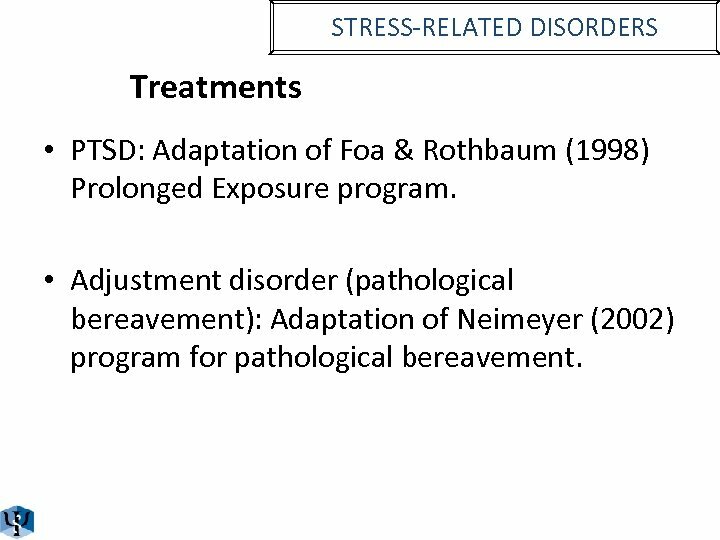 STRESS-RELATED DISORDERS Treatments • PTSD: Adaptation of Foa & Rothbaum (1998) Prolonged Exposure program. • Adjustment disorder (pathological bereavement): Adaptation of Neimeyer (2002) program for pathological bereavement. 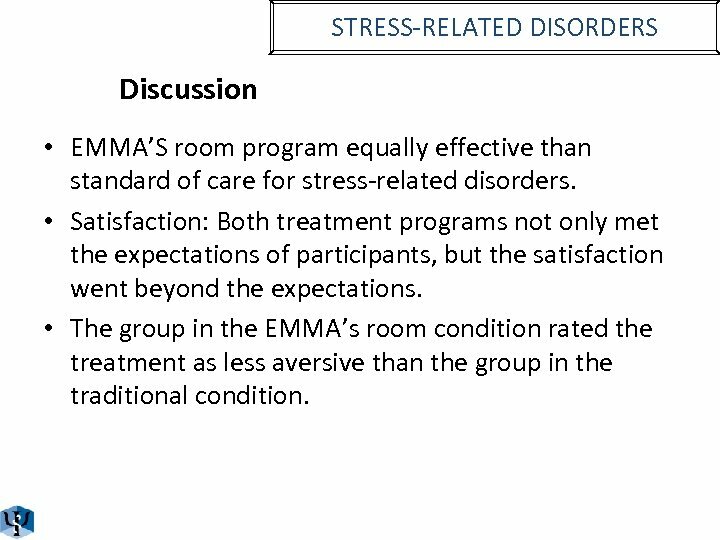 STRESS-RELATED DISORDERS Discussion • EMMA’S room program equally effective than standard of care for stress-related disorders. 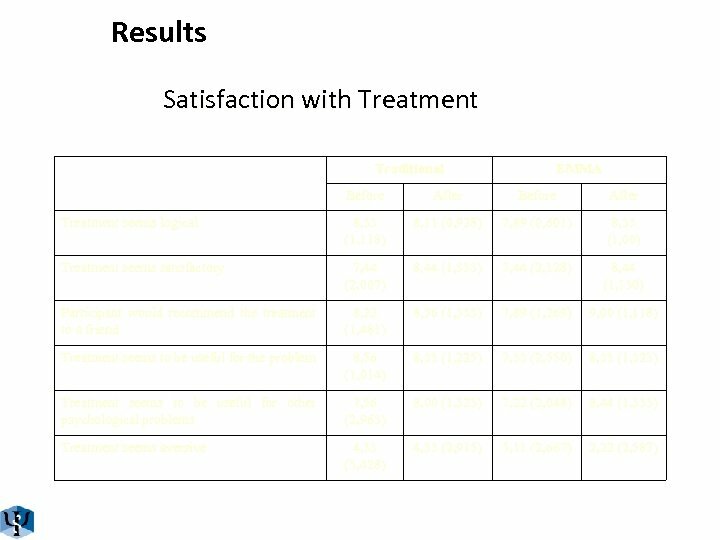 • Satisfaction: Both treatment programs not only met the expectations of participants, but the satisfaction went beyond the expectations. 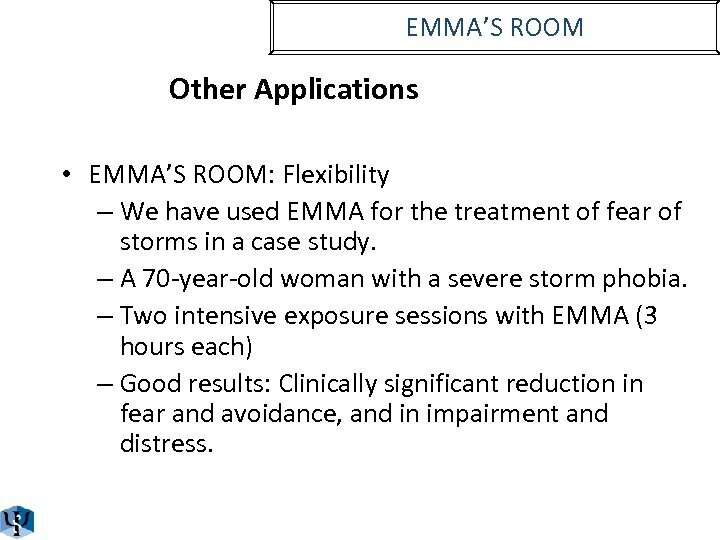 • The group in the EMMA’s room condition rated the treatment as less aversive than the group in the traditional condition. 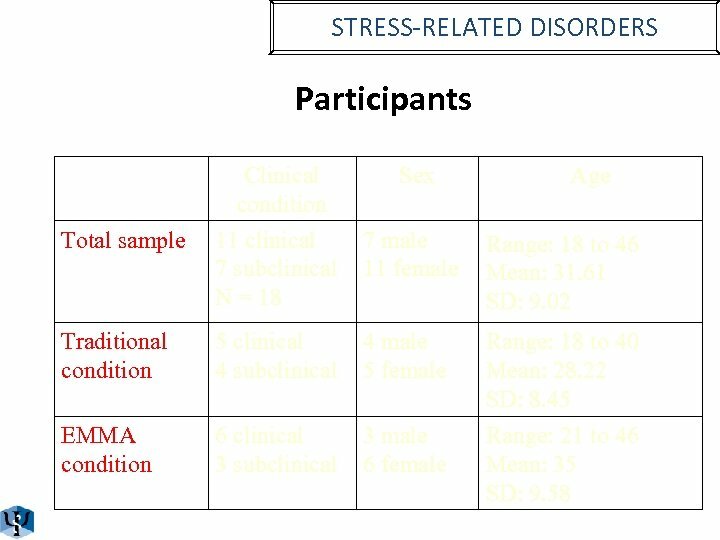 STRESS-RELATED DISORDERS Discussion • In both conditions participants reported being less perturbed, they accepted better the stressful event, and they are more open to new experiences in life. 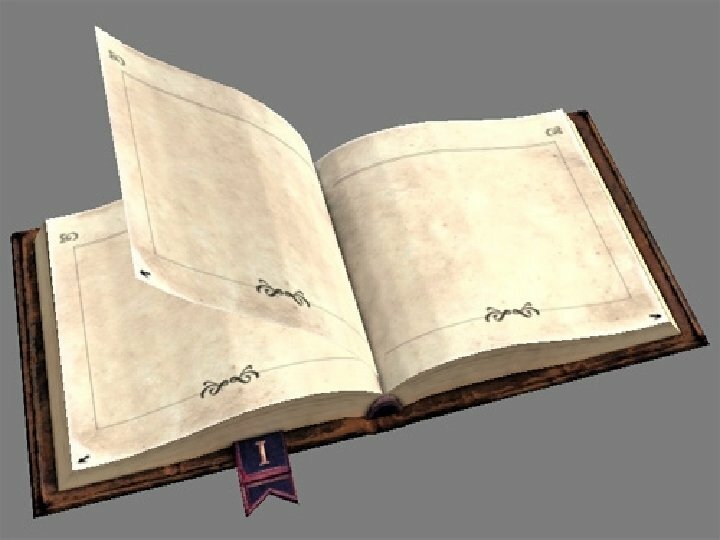 We would like to highlight that there is a tendency (p =. 07) in the EMMA condition for the variable openness to new experiences in life. 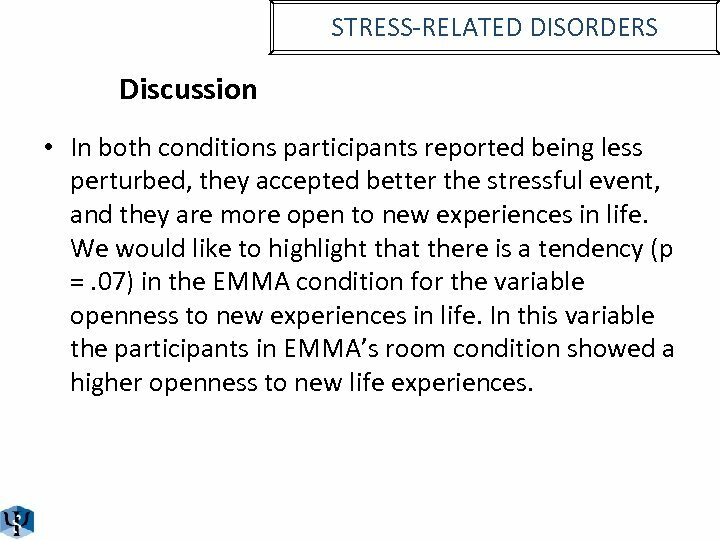 In this variable the participants in EMMA’s room condition showed a higher openness to new life experiences. 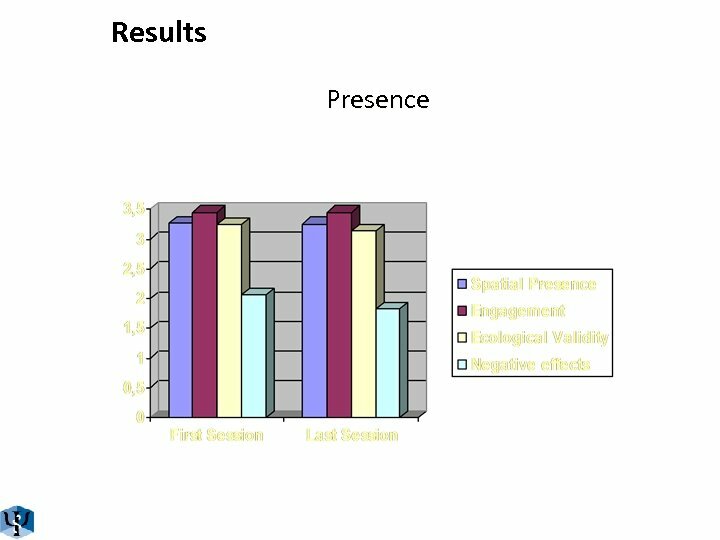 STRESS-RELATED DISORDERS Discussion • PRESENCE – Participants felt present in the experience: Spatial presence, Engagement and Ecological validity factors. 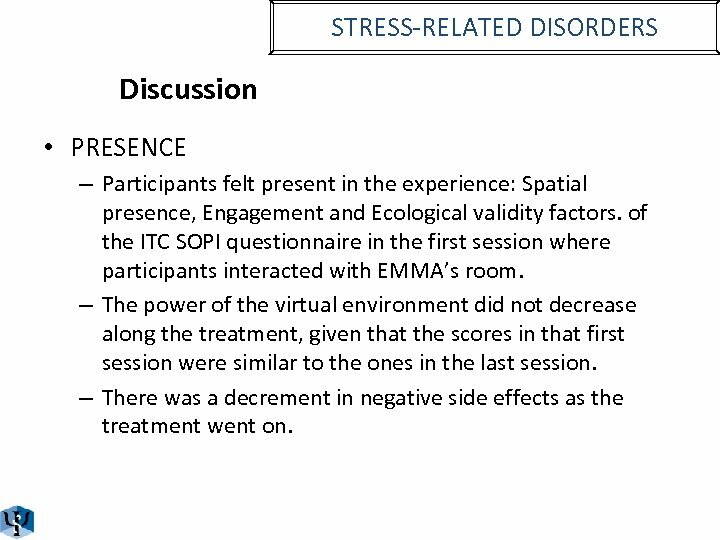 of the ITC SOPI questionnaire in the first session where participants interacted with EMMA’s room. 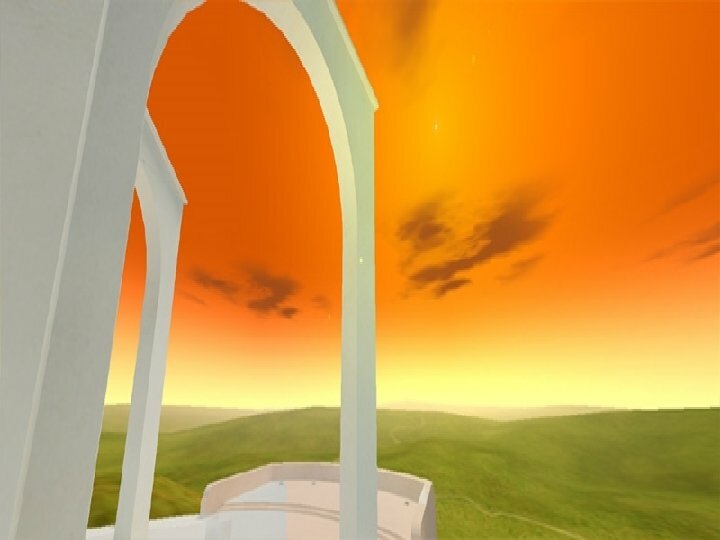 – The power of the virtual environment did not decrease along the treatment, given that the scores in that first session were similar to the ones in the last session. – There was a decrement in negative side effects as the treatment went on. 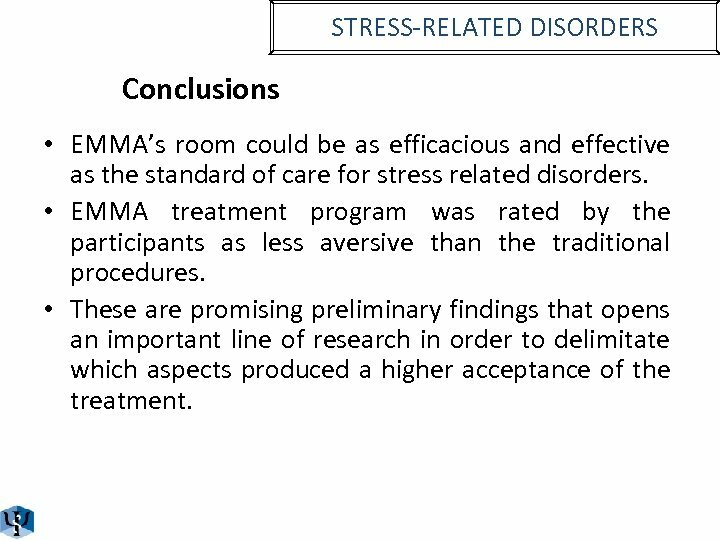 STRESS-RELATED DISORDERS Conclusions • EMMA’s room could be as efficacious and effective as the standard of care for stress related disorders. 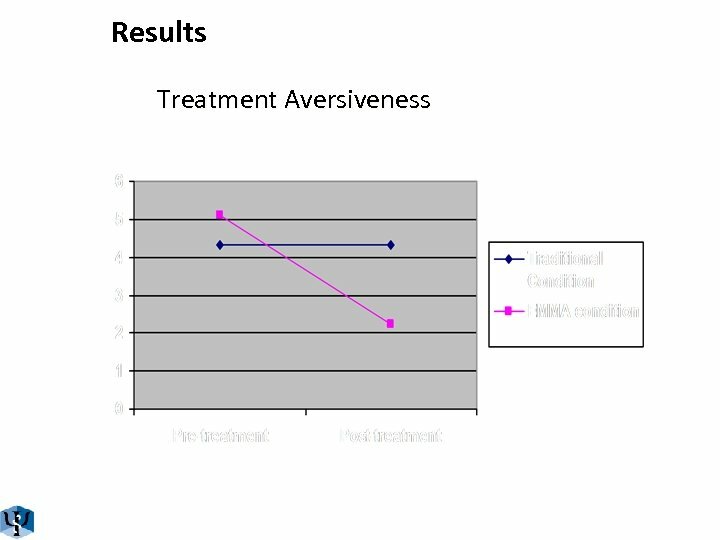 • EMMA treatment program was rated by the participants as less aversive than the traditional procedures. 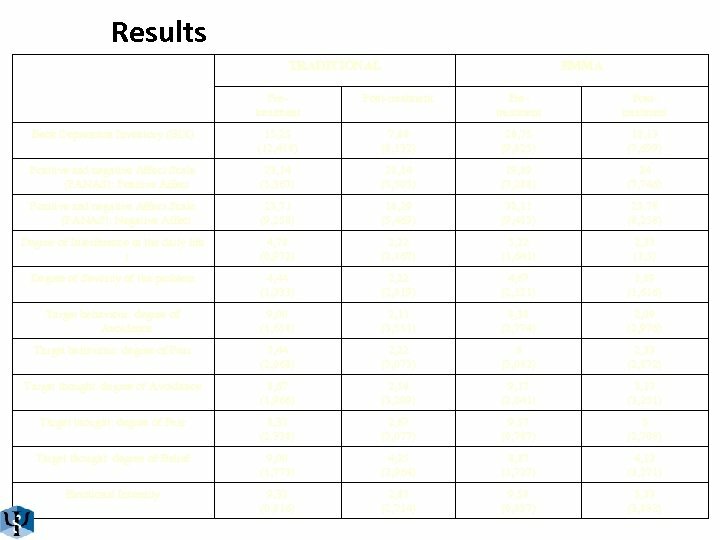 • These are promising preliminary findings that opens an important line of research in order to delimitate which aspects produced a higher acceptance of the treatment. 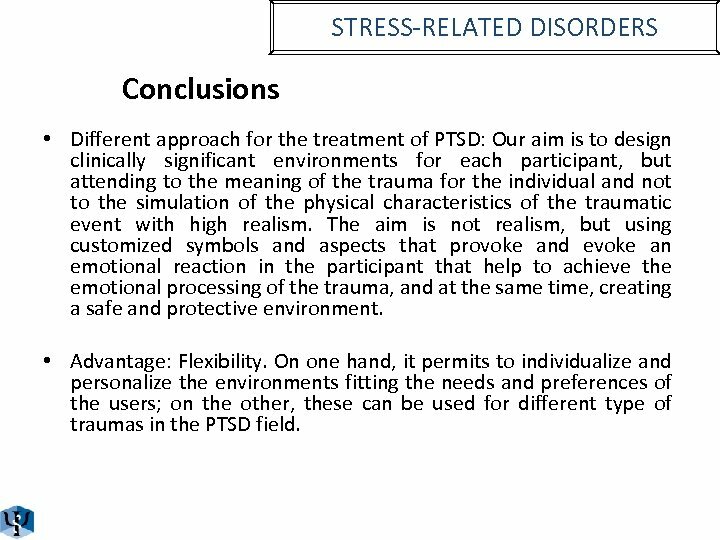 STRESS-RELATED DISORDERS Conclusions • Different approach for the treatment of PTSD: Our aim is to design clinically significant environments for each participant, but attending to the meaning of the trauma for the individual and not to the simulation of the physical characteristics of the traumatic event with high realism. The aim is not realism, but using customized symbols and aspects that provoke and evoke an emotional reaction in the participant that help to achieve the emotional processing of the trauma, and at the same time, creating a safe and protective environment. • Advantage: Flexibility. 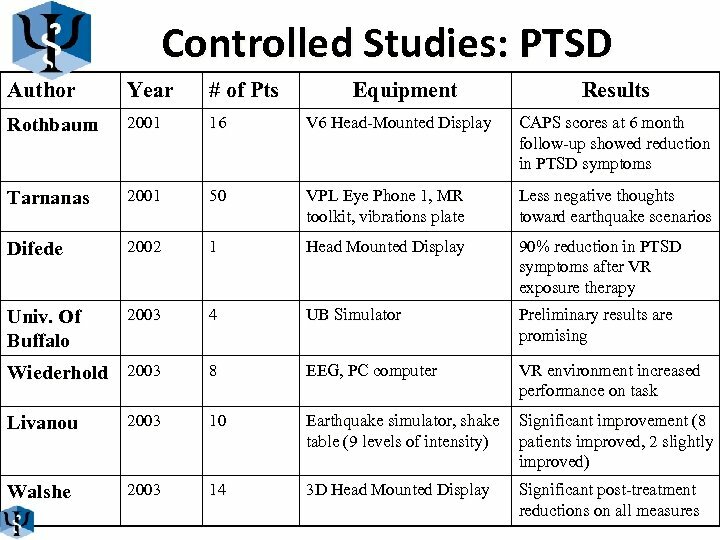 On one hand, it permits to individualize and personalize the environments fitting the needs and preferences of the users; on the other, these can be used for different type of traumas in the PTSD field. 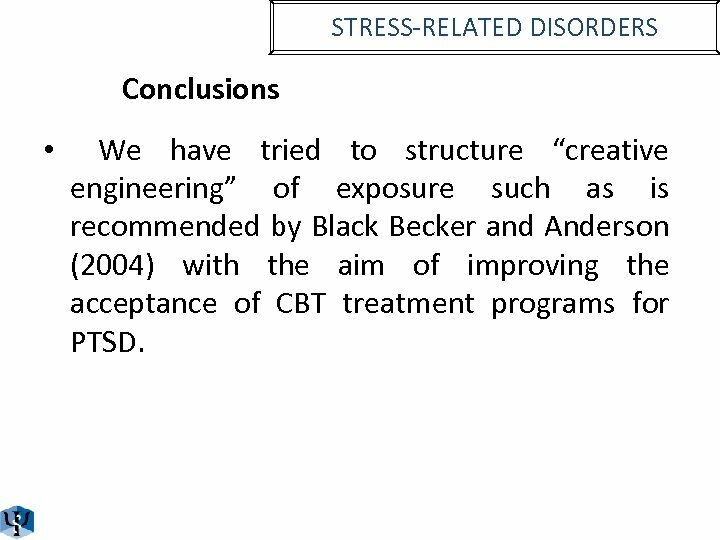 STRESS-RELATED DISORDERS Conclusions • We have tried to structure “creative engineering” of exposure such as is recommended by Black Becker and Anderson (2004) with the aim of improving the acceptance of CBT treatment programs for PTSD. • The Nature of Word Stress.